April 9 – April 18. 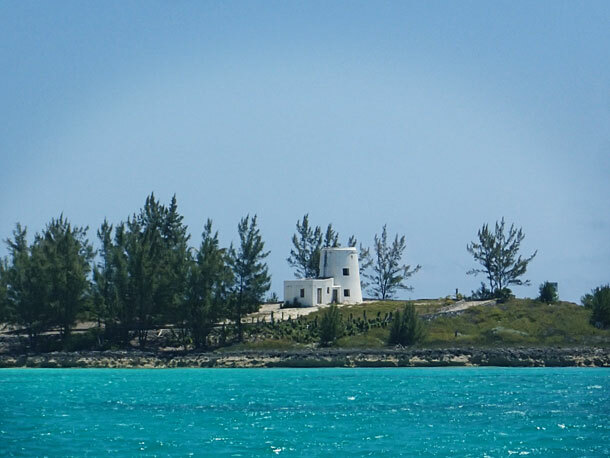 Greg snapped a pic of the light house on Whale Cay as we sailed by. Midnight, and the boat heaves from side to side. Time for the bridle drill. I go up on deck, pull in a kellet line, release the hook, and secure a bridle to the anchor line. The waves surge in from the left, so I work my way down the starboard side, holding on with one hand to keep from getting tossed overboard. I secure the end of the bridle to an aft winch and go back to the bow. I wait until the boat swings back to the left, then slowly let out anchor line (rode) until the bow faces into the waves. Now I am bouncing up and down instead of from side to side. Ahh. That was smooth. The rode didnâ€™t even try to go under the boat. I smile up at the full moon and walk back. Look Ma, no hands. A few hours later Iâ€™m awakened again by the side-to-side lurching of the boat. I go above to make adjustments. The moon looks a little weird. Thereâ€™s only one cloud in the sky and itâ€™s covering the moon? Later Duwan tells me there was a lunar eclipse. Actually, the eclipse is the only thing that makes this night seem unique among our nights in the Berryâ€™s. We spent Wednesday the 9th at Cambridge Cay while a cold front came through. It was actually kind of nice there. We cooked and cleaned all day. (I think I washed the food processor five times.) The wind raged. The rain poured. Waves crashed on nearby rocks and sandbars. But we felt snug here swinging to and fro with our neighbors. 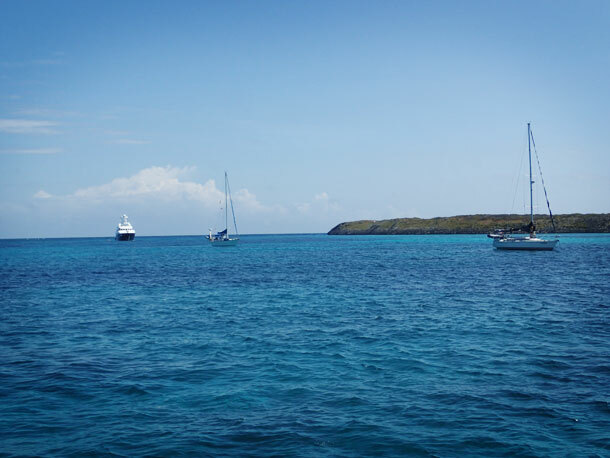 The next day we had a brisk sail to Normanâ€™s Cay, where a dozen boats anchored in the protected area south of us. We opted for a more open spot so we could make a quick getaway the next morning. The 40 mile trip to West Bay, New Providence was pleasant, as was the following dayâ€™s 25 mile hop to Frazierâ€™s Hog Cay in the Berry Island chain. As soon as we arrived, though, the squalls came and the wind blew. We aborted an attempt to anchor on the east side of Frazierâ€™s Hog close to the Berry Islands Club. We anchored instead off nearby Bird Cay just before a rainy squall hit. 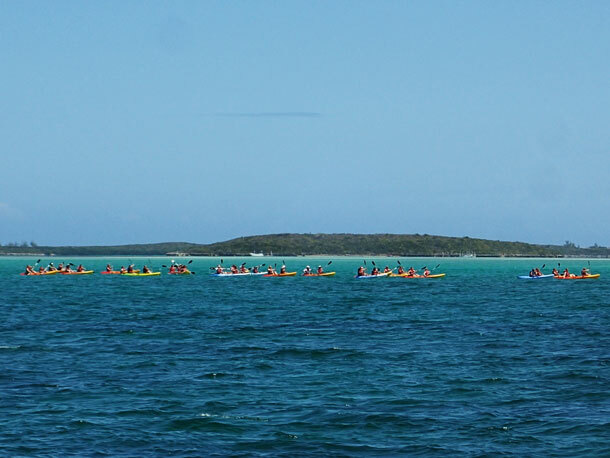 The next day we tried to visit a lighthouse on nearby Whale Cay, but it was too windy to row ashore. We sailed up to Little Harbor where we found that the tiny protected anchorage on our chart was actually too miniscule for comfort. We stayed instead on the northwest side of beautiful, private Frozen Cay. So here (after the eclipse) I hear on the 6:30am forecast that some really bad weather is coming. We were hoping that all the big cold fronts would peter out by mid-April. We could explore the Berrys and the Bight of Abaco. But for us, there is really no protection from fronts in these areas. We sail up to Slaughter Harbor at the northern end of the Berry chain for the first big front. Midnight again. Itâ€™s Thursday, no Friday the 18th now, and weâ€™re on the go. We are taking advantage of some brisk ESE wind to sail across the Great Bahama Bank to North Bimini. Right now we are about halfway there, just below Mackie Shoal. This is close to where we anchored one night at the beginning of the season. Another front is coming. This one will bring unfavorable winds for three days. We need to hide somewhere and Bimini is the logical choice. The direct route from Slaughter Harbor to Bimini is about 80 miles. Weâ€™ll end up sailing about 100 miles tonight. We want to be sure to arrive in the daylight. We couldnâ€™t seem to sleep during the day yesterday. Tonight we take turns at the helm, giving each other chances to rest. Menacing clouds loom the whole trip, but we get no rain. Thereâ€™s no beautiful sunrise in the morning. The clouds just turn from dark to light. But thereâ€™s Bimini! As we round the northern tip we see a huge construction effort that was not underway five months ago. There are six cranes near the Bimini Bay Resort, and a large dock is being built right out on the rough ocean side. We learn later that itâ€™s for a ferry to Miami. 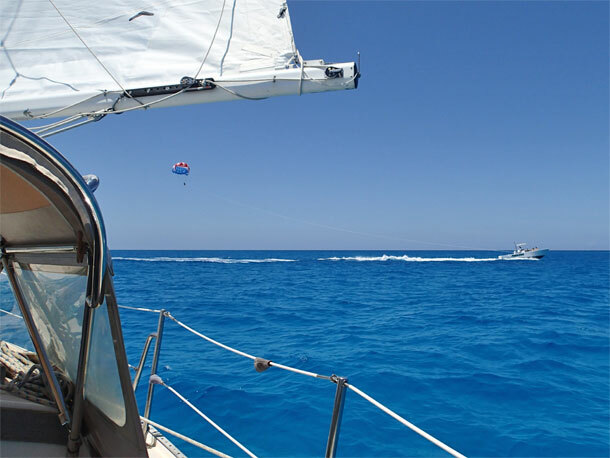 We run into a minor snag at the Bimini entrance as we take in the sails. I canâ€™t lower the mainsail. The shackle has gotten fouled on the boom topping lift. As we bounce around I fool with it, finally releasing the lift line. The boom drops to our dodger with a loud solid thump. I didnâ€™t realize it was that heavy. I get everything squared away and Duwan motors us in. The dock hand at Brownâ€™s Marina answers our hail on the VHF. It looks crowded, but he says he has a slip available. I go forward to man the mooring lines while Duwan steers us in, with strong current and a high breeze. Some of our new neighbors join the dock hand to help us. They are surprised at how smoothly Duwan takes us in. Seems a boat had trouble leaving this morning. He left big gashes in the dock and crushed his dinghy on the way out. Aah, Bimini! Let the wind do its worst. Weâ€™ll be fine here at Brownâ€™s. The anchorage at Frozen Cay was a little open. Little Stirrup Cay and Great Stirrup Cay, the islands at Slaughter Harbour, are the homes to cruise liner playgrounds. 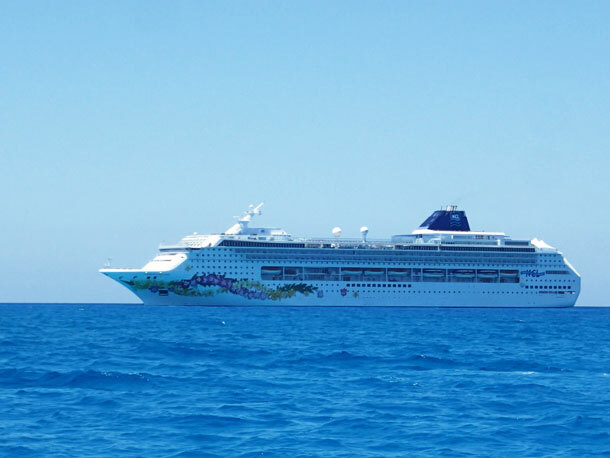 Three large cruise ships like this one were anchored outside the harbor as we approached. We passed a few parasailers as we approached Slaughter Harbour. Inside the anchorage at Slaughter Harbour passengers from the cruise ships were enjoying other types of water sports such as paddle boarding, jet skiing, kayaking in mass. This entry was posted in New Providence, The Bahamas, The Berry Islands, The Exumas. Bookmark the permalink. Are you on your way to fl today? I’m in hope town. Nice place, hope my anchor holds at this town.